I feel like I've been crafting all week, but have nothing to show for it yet --lots of things going out in swaps, bag sales, and back tack stuff. So, a little SHOP UPDATE: For anyone who purchased a bag last week, they're at the post office and on their way to you! Same goes for any swaps I've promised out this week. It's all coming!! My apologies for a bit of a late start in getting them out the door--it's been a crazy intense parenting week for me (is it possible for them BOTH to be going through "something" at the same time? Oy! I'm trying not to crack!). Now on to the fun little pieces of goodness that have floated in through the mailbox this week. 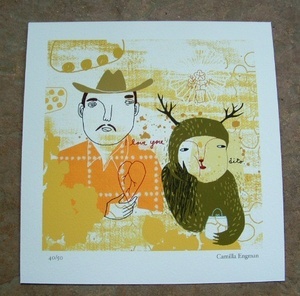 First, this amazing Camila print that I'm pscyched to have from her Tiny Showcase sale for Greenpeace. Beautiful!! I just saw the last print by Rachel Salomon that I'm bummed to have missed -- quite lovely. And from Heidi of My Paper Crane through My Favorite Mirror. 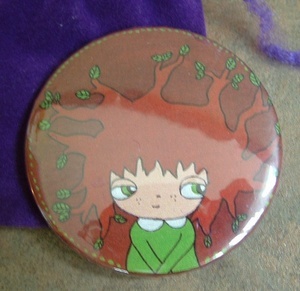 It was hard to photograph, but it's a little pocket mirror with Heidi's fabulous A Forest image on the back. I've been itching to get one of her paintings, but they sell so fast, this mirror seemed like it might appease me until I can get my hands on one! But it only made me want a print even more! So cute! 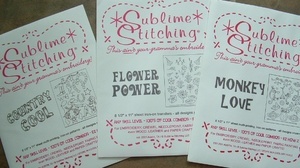 And MORE embroidery patterns from Sublime Stitching. I can't stop buying these--they're just so fun. I got Country Cool (hmn...what might that be for? 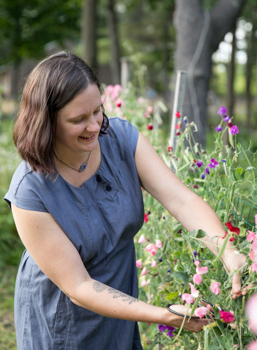 ), Flower Power, and Monkey Love for my monkeys. So fun. Alright...enough stalling. I need to get back to FINISHING my back tack project. I think I can, I think I can.